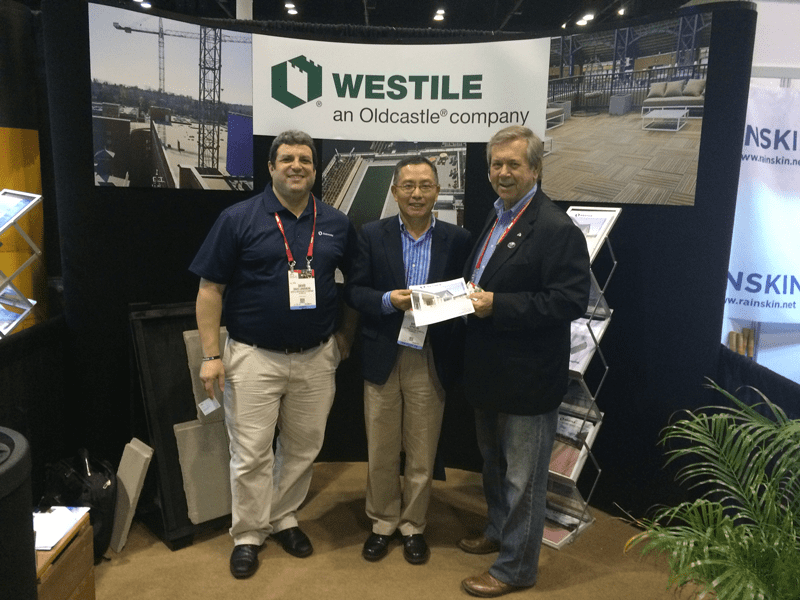 February 17-19, Westile educated thousands of eventgoers on how to improve the performance of commercial roofs or convert rooftops to usable plaza space at the International Roofing Expo in Orlando, Florida, a showcase of the latest trends and technology in the commercial and residential roofing industry. Eastern Regional Manager David Landsberg (left) and Indiana Sales Rep Ken Schmidt (right) discuss the benefits of roof pavers with an expo attendee. The Westile display included a showcase of the Ipê and Cumaru wood pavers, which provide an attractive and upscale look for rooftop plazas, and Westile Cubes, which can be used to build planters and benches. Westile also showcased a new Ballast Paver™ that was recently redesigned to maximize energy performance. In addition to product displays, Westile also offered product demonstrations on roof paver applications and installation techniques. Used on both new construction and reroofing projects, nationally available Westile roof plaza pavers are designed to provide years of protection in all climates with a wide selection of colors and finishes to enhance any architectural style. In addition, Westile’s line of flat roof interlocking Ballast Paver™ systems is designed to improve the performance of commercial roofs.